Are you a little too familiar with the "lost and found" box at your child’s school? If so, you're not alone—lots and lots of parents find that their kids' school materials seem to disappear into the most mysterious places, only to reappear weeks or months later. This is an ongoing struggle, of course, but it's never too late to start working it through. If you or a family member has a business card, show it to your child. Talk about how and why the cards are used. Then break out the craft supplies! Tell your child that she'll be creating her OwnSet of “business cards” for school. She will use them to label all of her materials, including her backpack, folders, notebooks and binders. She can also hand them out to her friends and teachers, so they'll know how to contact her. Ask your child how many cards she'd like. Cut 3x5 index cards in half to make a set of cards. On each card, your child should write all of her pertinent information with a fine-tipped marker. Brainstorm what sort of things she'd like to put on her cards. Important information may include name, school, grade, teacher, bus number, phone number and email address. When she's finished with the writing, encourage her to personalize her business cards with stickers, stamps, or hand-drawn designs. 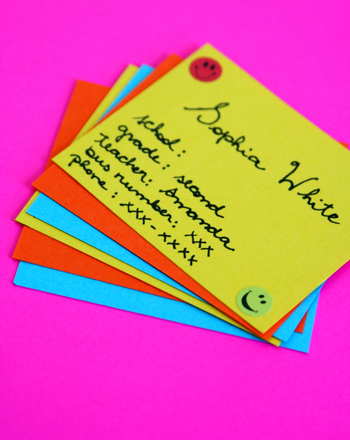 Assist your child in labeling all of her school materials, by attaching one business card to each item. Put the extras in a small plastic bag inside her backpack to pass out at school. Everyone has ideas about what they'd do if they could go back in time. See what your kid's ideas are and give her some creative writing practise in the process! Use these vocabulary cards with the EL Support Lesson Plan: Story Hooks. Use these vocabulary cards with the EL Support Lesson Plan: Conclude a Story. Use these vocabulary cards with the EL Support Lesson Plan: Map a Story. Send your child back to school with a colorful homework planner. Just print it out and stick it in your kid's backpack!